R. A. Spratt has a book with a new heroine. Fans of Nanny Piggins books will grab the first of this new series with alacrity. 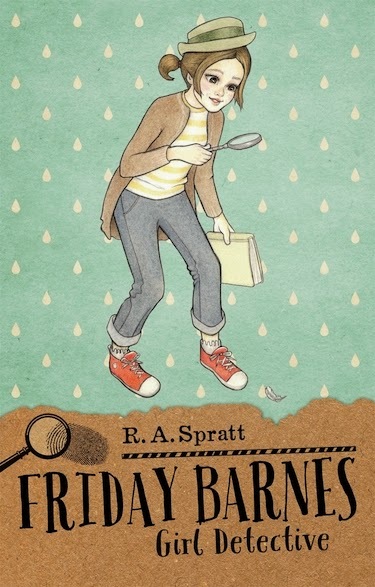 Friday Barnes Girl Detective is a novel, written by R. A. Spratt and published by Random House Australia, 2014. On arrival, Friday is shocked to discover the respectable school is actually a hotbed of crime. She's soon investigating everything from disappearing homework to the Yeti running around the school swamp. That's when she's not dealing with her own problem – Ian Wainscott, the handsomest boy in school, who inexplicably hates Friday and loves nasty pranks. Can Friday solve Highcrest Academy's many strange mysteries, including the biggest mystery of all – what's the point of high school? Friday is an unusual eleven-year-old. Her fierce intelligence is evident in her mature vocabulary, outstanding observation skills, and logic. She lacks common social skills and fashion sense. From the first pages where we see that Friday mostly raises herself, and that her friends are the books she reads, we’re firmly in her camp and hoping that she will make some friends. Boarding school does bring friends, but also a line-up of quirky characters who embroil Friday in hilarious situations. Spratt is a master at bringing characters to life, and knowing just what older primary and early high school kids want to read. Young readers will enjoy trying to solve the mysteries, and perhaps go on to read more books with puzzles or problems to solve. There are teacher notes to accompany the book. The book ends on a cliff hanger which I know will have kids clamouring for more of Friday’s own adventures. Do look out for Friday Barnes Girl Detective for your libraries, or as a gift for a child you love. This does sound right up my speed. Hoping it is eventually published in the US! I know Random in the US picked up Nanny Piggins, so fingers crossed, Jen.